← Of pitter-patter, pizza & muffins! Sometime back I discovered a diary maintained by my father in the early 1970s. Most of the pages revealed his heartrending efforts to buy a house in Bombay (it wasn’t Mumbai then), the kind of problems and anxiety he experienced till it was finally ready and he could to leave a crammed PG arrangement and move in. Even today, his struggle resonates with many others who similarly strive to make a home on their humble savings without any backing or inheritance at their disposal. From outside, the City of Dreams appears glitzy and welcoming but it’s seldom easy. Most of its service class inhabitants survive on hope, ambition and hard slog with a varying degrees of priority towards each of these qualities. The ultimate goal, of course, for most of us is to belong and a home is its definitive realisation. Adman, animator and filmmaker Bhimsain plays upon the idea and explores the consequences of taking short cuts to achieve this objective in his still relevant Gharonda starring Amol Palekar, Zarina Wahab and Dr Shreeram Lagoo. Dr Shankar Shesh’s story told in Gulzar’s discerning screenplay and dialogues (co-written by Bhushan Banmali) doesn’t limit its concerns to the grey areas of human behaviour or the technicalities of owning property in a rapidly expanding metro. Gharonda presents a straightforward view of life in Bombay for an average middle class office-goer—the good, the bad, the ugly, the complete package. If it acknowledges the sense of self-sufficiency the commercial capital offers, it also bluntly points out the disillusionment, indifference and loneliness it spawns. 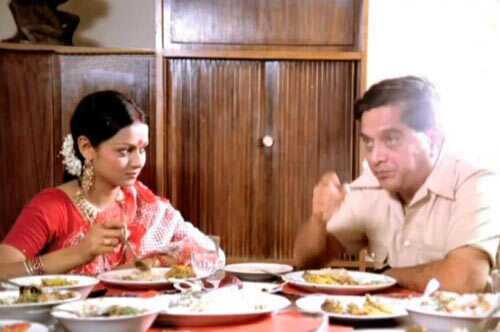 Unlike Palekar’s Chhoti Si Baat or Baaton Baaton Mein, which too sets itself against the city’s brisk pace and everyday sights, the 1977 release isn’t steeped in feel-good humour but pragmatism, tons of it. But before the film arrives to such solemn conclusions, Palekar and Wahab portray the gratifying side of realism with charming simplicity. 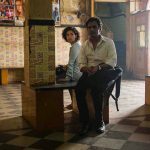 His Sudip is a clerk, her Chhaya is a typist and they both sit on adjacent desks in a cosy working space of six employees including an office attendant. The atmosphere is most believable with the faithful sound of typewriter filling the background and a staff that is alternately vain and dedicated. Dr Shreeram Lagoo’s Mr Modi plays the middle-aged boss recuperating from a delicate heart condition. Donning bell-bottoms, partially unbuttoned shirts and printed cotton saris paired with an omnipresent red sling purse respectively, Sudip and Chhaya bond over cool nariyal pani and spicy bhelpuri, roaming around the sparsely populated Chowpatty beach and brand new Marine Lines bridge, watching the towering skyline of Bombay perched on a throne of rocks, soaking in the breeze exclusive to front-seaters of the classic red double decker, oblivious to the deafening factory alarm set out by industrial units, a booming reminder of this city’s once throbbing mill culture. They’re as Gulzar, lovingly, paints, ‘Do deewane shaher mein. Raat mein yaa dopahar mein. Aabodaana dhoondte hain ek aashiyana dhoondte hain.’ The poet and filmmaker won a Filmfare trophy for Best lyrics. And indeed Premchand’s brand of realism is what ensues after the builder dupes them and absconds with all the money resulting in the suicide of Sudip’s roomie, who’s invested all his life’s savings to purchase the intended flat. This incident turns the otherwise optimistic Sudip into a picture of cynicism and he proposes a dark, depraved solution to Chhaya – marry the rich, (most likely) dying employer and end their collective misery. 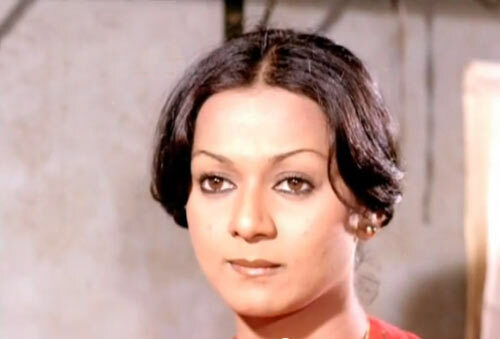 Chhaya agrees to wed the boss with whose deceased wife she bears an uncanny resemblance. Only this isn’t some generic Bollywood potboiler and no dramatic violins are brought into play. Nor does the camera go overboard to capture any sinister expression on Palekar or traces of greed in Wahab. Bhimsain’s characters are products of terrible hardships, pressing needs or deep-rooted loneliness. Sudip’s suggestion, while most despicable, is born out of desperation, frustration and anger — Is shaher ke log rone ke liye kandha nahi dete, marne ka intezar karte hain kandha dene ke liye. And his subsequent regret and newfound integrity when Lagoo unsuccessfully attempts to provide financial aid only implies his earlier behaviour was nothing more than an ugly outburst that Chhaya lacked the wisdom to deal with. On the other hand, there’s no judging Chhaya. She makes a conscious decision to squash her desires and marry into affluence in order to provide a better life for her further-studies aspiring kid brother. Chhaya’s elder brother made a sacrifice for her previously; it’s a cycle she’s conditioned for. In Bollywood, romance bears a do or die sentiment but in Bhimsain’s lifelike view, people can/do move on. Chhaya honours the commitment she’s made and makes a genuine effort to blend in her luxurious lifestyle without compromising on her core values. ‘Guldaste mein rakhi rahegi toh jad kaise pakedegi?’ says an onlooker from her neighbourhood. It’s not the smoke-filled company of rummy-playing socialites she cares for, preferring the undivided attention of her older half at their palatial home in the country or watching a staged adaptation of a chapter in Ramayana in its goofiest avatar (few years before Jaane Bhi Do Yaaron spoofed an important scene from Mahabharat). Despite ‘he says Eiffel Tower in Paris, she says Borivali‘s National Park’ worldview, there’s palpable warmth between the odd couple. Her growing attachment works persuasively only because Lagoo, in a Best Supporting Actor Filmfare award winning turn, comes across as not some well-off compromise but a charismatic, patient and pleasurable companion. The triumph of his character lies in his composed, unflustered persona, glimmering eyes that appear to read everyone’s mind and Gharonda’s deftly written lines that convey a world in just two sentences. It’s one of the veteran’s most polished performances and so much more than the pained patriarch Hindi films limited him to. 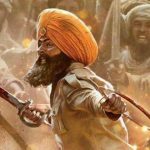 In a year, when audiences were regaled with out-and-out entertainers like Amar Akbar Anthony, Dharam Veer and Hum Kisise Kum Nahin, director Bhimsain (who’s also responsible for the classic animation short, Ek chidiya anek chidiya) stands out with a critically-acclaimed film that relates the woes and wants of folks residing in those matchbox sized abodes of Mumbai, Bombay, Bambai -you prefer. 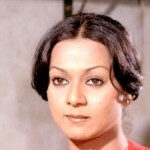 Free of superficial attractions, Gharonda relies on Amol Palekar and Zarina Wahab’s accessible personality to make an easy connection. Gulzar and Naqsh Lyallpuri’s free-flowing verse, Jaidev’s timeless score, even though there are only three songs – Do deewane shaher mein, Ek akela is shaher mein and Mujhe pyaar tumse nahi hai, in Runa Laila’s peppy rendition and Bhupinder Singh’s marinaded-in-mint voice lend Apurba Kishore Bir’s unadorned imagery a zest of its own. This article was first published in rediff.com. This entry was posted in Classics, Columns & Reviews and tagged amol palekar, bhimsen, bhupinder, bombay, dr shreeram lagoo, gharonda, gulzar, jaidev, runa laila, zarina wahan. Bookmark the permalink.